The Vandals first entered the collapsing Roman Empire from Germany in the winter of 409 AD. They crossed the frozen Rhine river with a group of Alans and Sueves. The Vandals were taking advantage of a rebellion within the Empire that kept the Romans from defending themselves well. The Vandals (with the Alans and Sueves) slowly walked and rode on horse-drawn wagons south through Gaul (France), looting and fighting as they went. When they reached the Pyrenees mountains that separate France from Spain, one of the rebel leaders actually invited them into Spain, in exchange for their help with his rebellion. After this rebellion failed, and the rebel leader was killed, the Vandals were left on their own in Spain. They took over the southern part of Spain in about 411 AD. A Visigothic attack in 415 AD weakened them but did not destroy them. By 429 AD, the Vandals decided to move to Africa instead of Spain, and ferried all 80,000 of their people across the Straits of Gibraltar in boats. Under their king Gaiseric, the Vandals established a kingdom in Africa, which they used as a base for piracy around the Mediterranean for a hundred years. 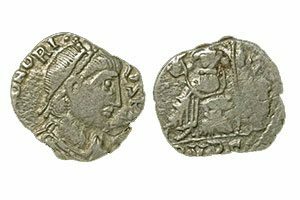 They set up an Arian church, minted their own coins, and had diplomatic relations with other Mediterranean kingdoms. They went right on selling African pottery around the Mediterranean. But in 533 AD, the Roman Emperor Justinian sent his general Belisarius to reconquer Africa for Rome. When Belisarius succeeded, the surviving Vandals stopped identifying as a separate group and just married into the rest of the African population. Cite this page: Carr, K.E. The Vandals – Early Middle Ages. Quatr.us Study Guides, August 2, 2017. Web. April 25, 2019.